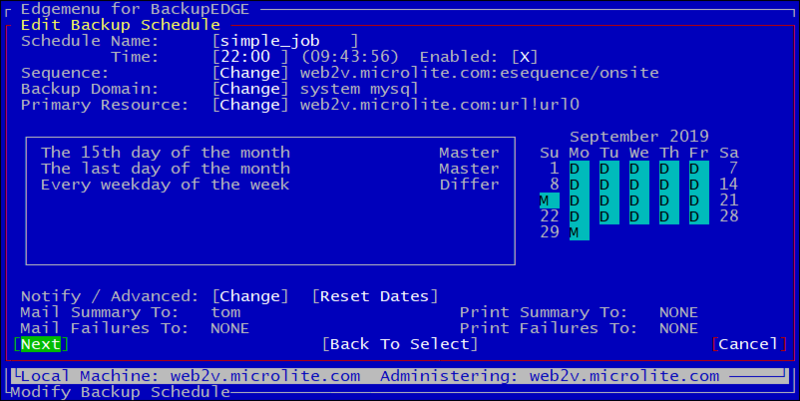 The BackupEDGE Scheduler is unique in the industry. It combines the use of Backup Retention Times, Triplets Scheduling and Lazy Reclamation to provide the most powerful and diverse scheduling ability in the industry. An unlimited number of Schedules may be created. Each Schedule may have an unlimited number of Triplets, each with a separate Backup Retention Time. A default Schedule is created on installation, providing a nightly Master Backup with a one week Backup Retention Time (one day for tape). It may be modified as necessary. A triplet is a combination of a Frequency, Day Variable and a Time Frame, for example 1st Friday of March, or Last Day of Year. When creating a triplet you will be able to choose from the options “week”, “month”, “year” or a specific month. After choosing this you will then be able to specify the day(s), such as “Monday” or “Weekday”. Then depending on the previous choices you will see Frequency Options such as every, last, first, 10th. 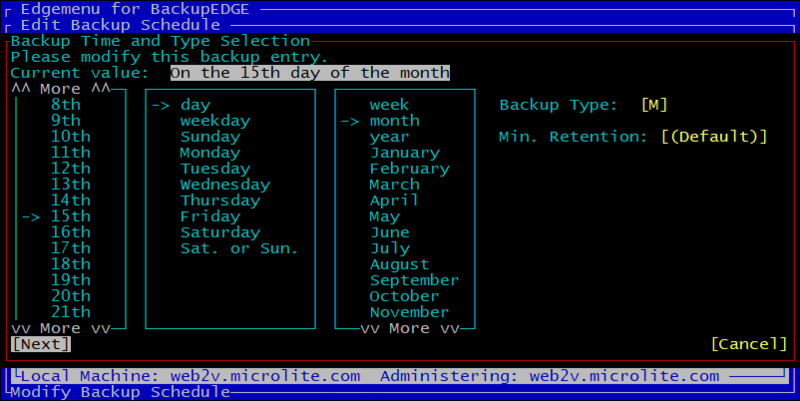 These options will permit you the ability to control granularly your backups down to the day of the year. 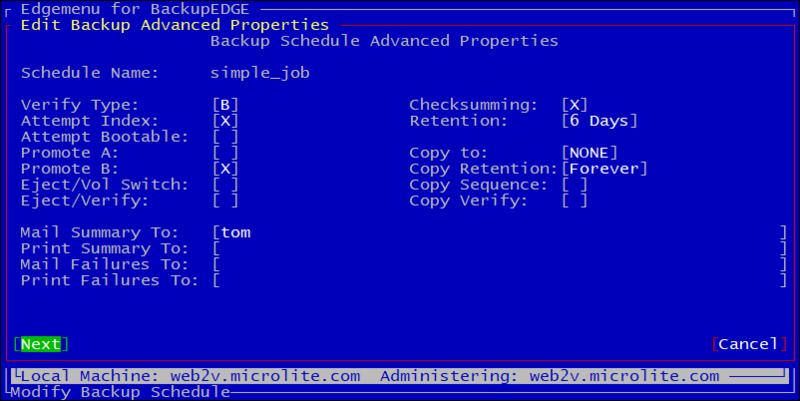 Backup Retention Time is the amount of time that must pass before BackupEDGE will attempt to delete or overwrite a backup. After triplets have been created you may order them by priority in the Backup Schedule window. The priority of the backups will work from the top down. For instance, If you have a Differential Backup running every day of the week and a Master Backup running every 1st day of the month, the order of these will affect the backups. 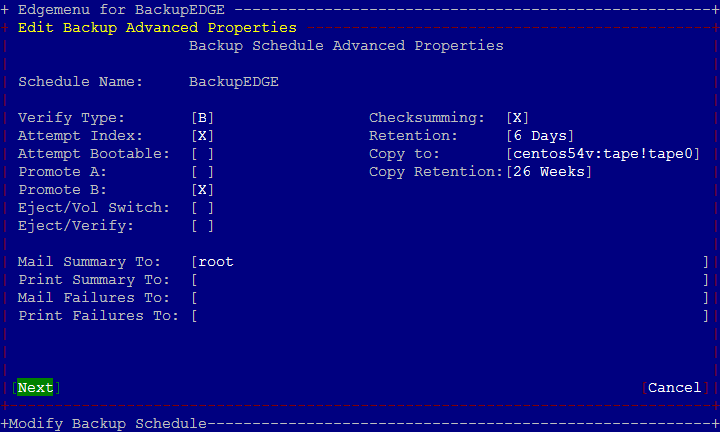 If the Master Backup is first (on top), then it will override the Differential Backup on the first day of every month. On other days, a Differential Backup will be performed. In contrast, if the Differential Backup is first, then it will have priority over the Master Backup. In this particular case, a Master Backup will not be performed at all! 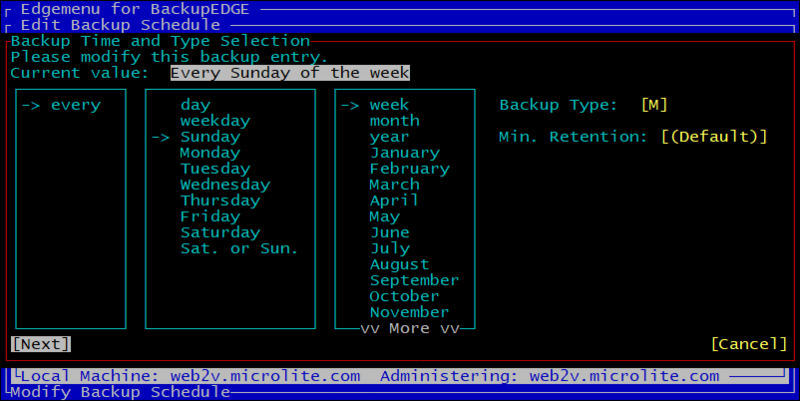 Screen shots below will show the default backup Schedule, one that has been modified, and the modification screen. 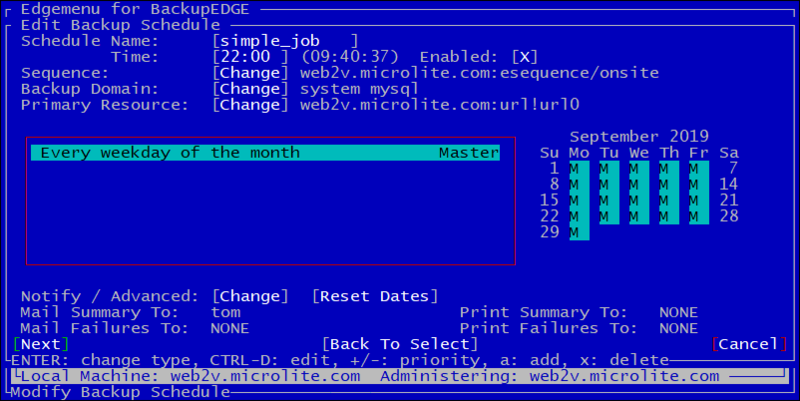 As you make changes to a schedule, a calendar on the right side of the screen will change to show your selections. There is more than one way to approach scheduling; both the first and second screens below perform essentially the same action. Archive Retention Times (TTL) are settable per-Triplet in BackupEDGE 03.00.02 and later. 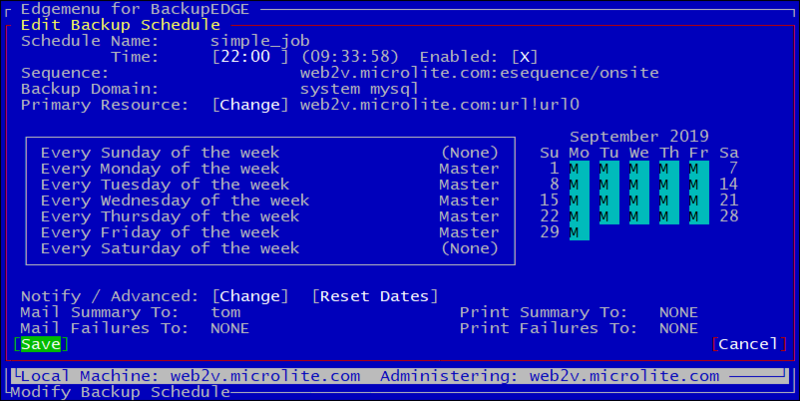 Advanced Scheduler - A second method of performing weekday-only backups. On the Notify / Advanced screen in the Schedule, set the Retention: period for each archive. You may also set a Copy to: device with a retention time for making a copy of the archive after the Scheduled backup has been completed.